NOTE: It has been brought to my attention that you can now get this set, WOOD MOUNT ONLY from the Clearance Rack in the ONLINE STORE. The cost is $11.99. If you are interested in this set, I would recommend you quickly purchase it because, as with all clearance items, once they are gone, they are gone. Happy Tuesday everyone! This is one of two posts today using the Monstermaniacs set so if you would like to see some cards also made with this, check out this post! Welcome to a NEW SUO challenge! This time the theme is Boxes, Bags and Baskets. Hmmm…can you guess which I decided to do? LOL!!! Anyway…like I said I’ve been playing quite a bit with this set and had some of those ‘left over pieces’ and along with left over pieces from the Celebrations Basics (Banner) Kit and the Bermuda Bay Celebration Add-On Kit, I was pretty much set! Fold over top of bag and add strip of dsp (from Add-On Kit) to the back of the flap. Fold over. 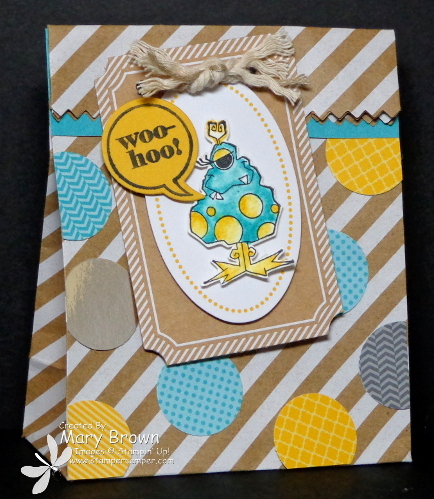 Tag: Tag from the Celebrations Kit, add Oval from the Add-On kit using Dimeensionals. Stamp monster in StazOn Jet Black, color with Bermuda Bay and Crushed Curry (on watercolor paper) and add to Oval using dimensionals.. Stamp Woo Hoo using StazOn Jet Black on Crushed Curry, cut out with matching Bubbles Framelit, add using dimensionals. Use Crop-o-dile to punch through all layers of bag and tag. Use the cool rope that comes with the Celebrations Banner Kit to tie it one. Fray edges. Yep…that covers it! LOL!!! Now check out the other wonderful creations from the SUO Design Team! This entry was posted in 3D, SUO Challenge and tagged Just Sayin', Monstermaniacs. Bookmark the permalink.